From the onset of this week, I have been eating a lot of snacks throughout during my work. On Monday, one of my colleagues got a box of Cashew and Tutty fruit biscuits from Karachi Bakery in Hyderabad. On Tuesday, one of my other colleague got us loads of cakes and melt-in mouth cookies which was prepared for his brother's wedding. And yesterday, Venkat who went for a visit to Guruvayur last weekend brought 3 large pack of nendran and chakka chips. Somehow food is associated with all of us and I have been busy in talking about food all these days. I know it is not going to end at least for a week. My husband and myself used to discuss these kind of topic on food most of the time. Few months ago, we visited a nearby pastry and cake shop to buy a cake. We went through all the cakes listed in the menu and tasted few of them (only a sample :) before ordering one. We were also attracted by a couple of savory pies along with some sweet pies. I already had an idea of making paneer pie and after seeing the one at shop, we ordered it to see how it tastes. 1) Mix all purpose flour and salt in a mixing bowl. 2) Add chilled butter and mix well till you don't see any butter lumps and the mixture looks like breadcrumbs. 3) At this moment, add chilled water and make a dough. 4) Wrap it using a cling wrap and refrigerate it for minimum 30 minutes. 5) Meanwhile prepare the filling. 1) Heat oil in a pan. Add cumin seeds and let it crackle. 2) Add chopped garlic and saute it for two minutes. 3) Add sliced onion and saute till the onions are translucent and soft. 4) Add red chilli powder and salt. Saute for few minutes and make sure the masala is not burning. 5) Add paneer to this and saute again for few minutes and turn off the flame. Do not over cook otherwise paneer becomes hard. Let it cool. 1) Preheat the oven for 15 minutes with the temperature of 175C or 350F. 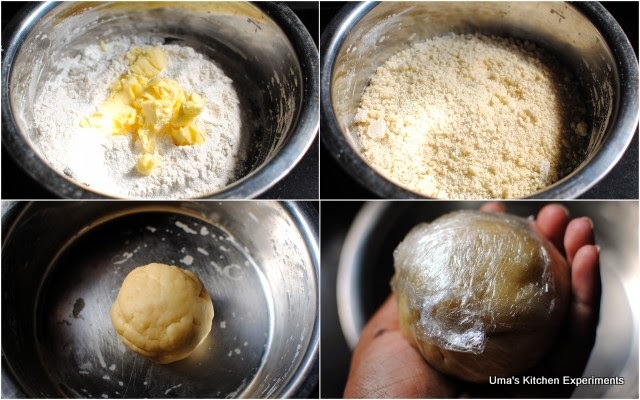 Take out the pastry dough from refrigerator and remove the cling wrap. 2) Roll into 1/8 inch thickness sheet. Using a cookie cutter cut into round shape and place it in the cupcake tray as show in the picture. 3) Place the stuffing into it and seal the pies as per your favorite designs. Brush it using oil or butter. You can also use egg white for perfect shine. 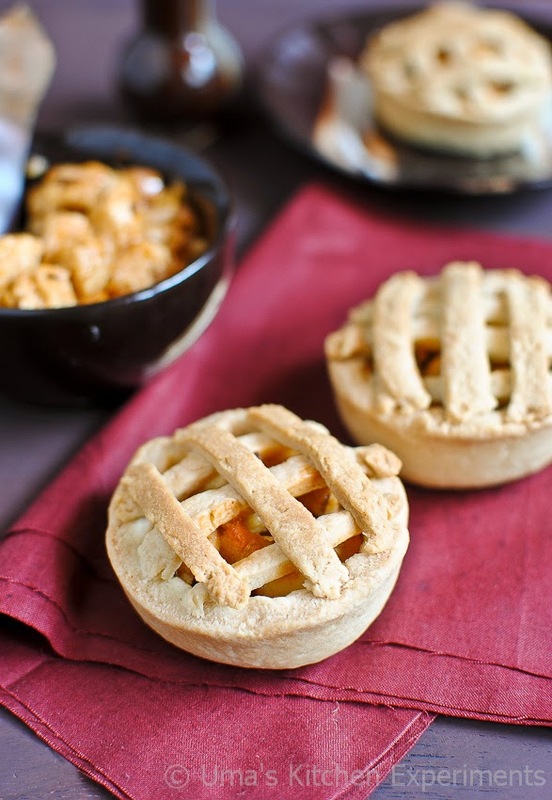 4) Bake it in the preheated oven for 40 to 45 minutes or till you get a slight golden brown pies. 5) Cool for a minute and remove from cupcake tray carefully. 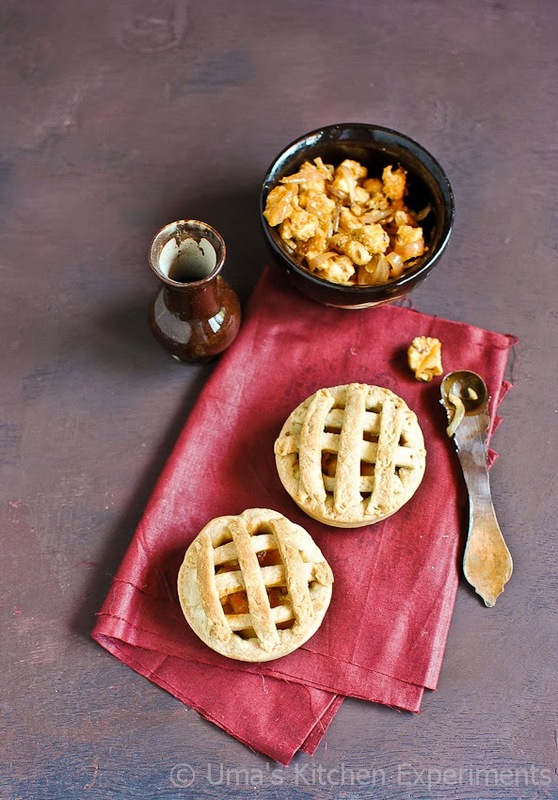 Savory pie sounds yum, especially to munch on during the rainy season.....love your clicks. 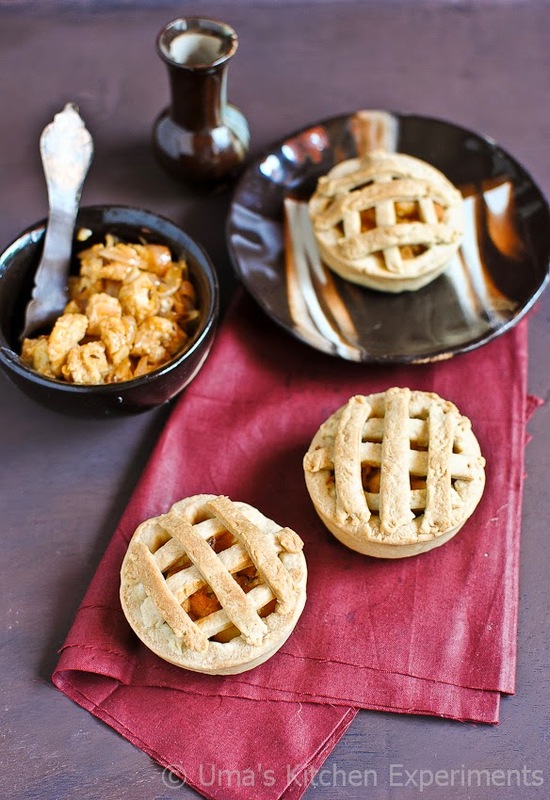 Nice recipe, the pies looks delicious..
Wow perfectly made pies....loved the tray Uma!!! 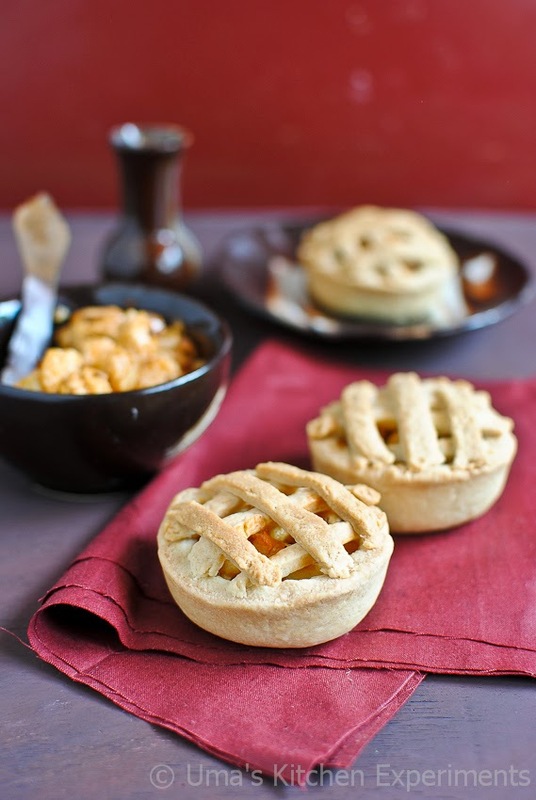 beautiful pies,yummmy & perfect !! !